Halo: The Master Chief Collection is a compilation of first-person shooter (FPS) video games in the Halo series for the Xbox One, Microsoft Windows and PC. Released originally on the Xbox One on November 11, 2014, and later in 2019 on PC the collection was developed by 343 Industries in partnership with other studios and was published by Microsoft Studios. The collection consists of Halo: Combat Evolved Anniversary, Halo 2 Anniversary, Halo 3, and Halo 4, which were originally released on earlier Xbox platforms. Each game in the release received a graphical upgrade, with Halo 2 receiving a high-definition redesign of its audio and visuals that are exclusive to the collection. The game includes access to the live-action series Halo: Nightfall as well as the Halo 5: Guardians multiplayer beta that was available for a limited time. Each game in the compilation retained its original story and gameplay, with the exception of Halo 2's cutscenes which were extended by Blur Studio. The collection's multiplayer features every map originally released with each title, including six remastered Halo 2 maps. In the Halo 2 anniversary campaign mode, players can switch between the original game's graphics (top) and new graphics (bottom) with the press of a button. The Master Chief Collection consists of Halo: Combat Evolved Anniversary, the anniversary edition of Halo 2, Halo 3, and Halo 4, complete with their full catalog of extras, including all multiplayer maps and gameplay modes. There have been no story or gameplay changes to the original releases. The games are first-person shooters with vehicular combat that takes place from a third-person perspective. All four campaign modes can be played alone or cooperatively via split screen or Xbox Live. Each campaign has four difficulty levels and access to gameplay modifiers known as "Skulls". As in Combat Evolved Anniversary, Halo 2 players can swap between the original and upgraded graphics on the fly. Additions to Halo 2's campaign mode include "Terminals", and new prologue and epilogue cutscenes to link the series for Halo 5's debut. Since only six of the game's multiplayer maps were remastered, there are two Halo 2 multiplayer modes. The Halo 2 anniversary multiplayer mode uses the six remastered maps, while the standard Halo 2 multiplayer mode includes all of the original game's released maps with a full graphical update but no remastering. The Collection multiplayer includes Mission Setlists, curated lists of levels selected from throughout the series. The Extras menu includes access to live-action video series Halo: Nightfall and the Halo 5: Guardians multiplayer beta, until it was removed prior to the game's release. The compilation features new Achievements, and all difficulty and play modes are unlocked from the start. The game launched with a total of 4,000 Gamerscore spread across 400 Achievements—the largest amount of Gamerscore given to a game since its introduction—with another 500 Gamerscore, spread across 50 Achievements, being released in a day-one update. With the release of Spartan Ops a few months later, an additional 50 Achievements, worth 500 Gamerscore, were released. In May 2015, another 100 Achievements, worth a total of 1,000 Gamerscore, were released alongside Halo 3: ODST. The collection was developed by 343 Industries in conjunction with Certain Affinity, Ruffian Games, Saber Interactive, Blur Studio, and United Front Games. Following the announcement of The Master Chief Collection at the Electronic Entertainment Expo 2014, Phil Spencer, head of Microsoft's Xbox division, stated that the collection originally began as just a remastering of Halo 2 to celebrate its 10-year anniversary. 343 Industries decided that it would be a great opportunity to release the other main Halo titles for the Xbox One in preparation for the 2015 release of Halo 5: Guardians. All of the games run at 60 frames per second and have received lighting upgrades; all but the Halo 2 remake have a native resolution of 1080p. On October 18, 2014, the game had been declared gold, indicating it was being prepared for duplication and release. Combat Evolved Anniversary is based on the high-resolution remaster of the original released in 2011 for the Xbox 360. Kinect features from the Xbox 360 version are not supported in the Xbox One collection. Stereoscopic 3D features from the Xbox 360 version are not supported in the Xbox One collection. Ruffian Games was responsible for developing the Halo 3 and Halo 4 ports. 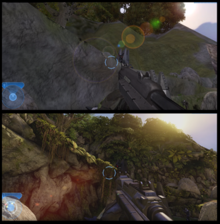 Halo 3 and Halo 4 received only a simple lighting upgrade, and an increase in both frame rate and rendering resolution. 343 Industries designed the interfaces and online networking. United Front Games worked on the unified interface that works across all games. Coinciding with the release of The Master Chief Collection, 343 Industries developed the Halo Channel, an application for the Xbox One and Microsoft Windows. It is a successor to the Halo Waypoint app that was released on the Xbox 360. The Xbox One app is integrated with the collection, allowing players to access Halo: Nightfall and "Terminal" animations, unlock rewards for the game, and launch the games directly from the app. A comparison of original game's character models (top) and new character models (bottom). Saber Interactive, which co-developed Combat Evolved Anniversary, assisted in the remake of Halo 2's campaign. It received a complete visual overhaul. The game's soundtrack and sound effects, such as weapon audio, were updated as well. The refined Halo 2 cutscenes, as well as two new cutscenes created to complement the Halo 5: Guardians story line, were produced by Blur Studio. They feature the same structure and timing of the originals, and motion capture was utilized for the animation. "Terminals", a feature first introduced in Halo 3, were added to the Halo 2 Anniversary campaign. Their purpose was to create a "connective tissue" for stories within the Halo universe that explores the relationship between the different races within the Covenant and extensively covers the events portrayed in Halo 2. Terminals also gave 343 Industries the opportunity to introduce Spartan Locke, a main character in Halo 5: Guardians. Visual effect studio The Sequence Group collaborated with 343 Industries to provide the animation; the group had previously performed similar work in Combat Evolved Anniversary and Halo 4. Several voice actors reprised their roles including Keith David as the Arbiter, John DiMaggio as the Heretic Leader, and Tim Dadabo as 343 Guilty Spark. Mike Colter provided the voice-over for Spartan Locke. Once the Halo 2 Anniversary project was green-lit, executive producer Dan Ayoub at 343 Industries reached out to Max Hoberman of Certain Affinity for assistance on the multiplayer component. Hoberman originally designed Halo 2's multiplayer and founded Certain Affinity after leaving Bungie in 2006. Certain Affinity was asked to remake several of the multiplayer maps from Halo 2. The team found it difficult to decide how many of the original 24 maps to redesign and eventually settled on six – two small, two medium, and two large – to provide some variation. Along with the visual upgrade, Halo 2's original score was re-recorded with the San Francisco Symphony at Skywalker Sound studio. Guitarist Steve Vai returned to the franchise to play on additional tracks with Periphery guitarist Misha Mansoor. The Halo 2 Anniversary soundtrack was released on November 11, 2014. On June 9, 2014, Halo: The Master Chief Collection was announced at the Electronic Entertainment Expo with a trailer titled "Hunter and the Hunted". The trailer was created by animation company Digital Domain, which had previously collaborated on other Halo commercials. The trailer recreates a moment from Halo 2, in which the Master Chief rides a bomb into a Covenant ship. It is narrated by Keith David, who voices the Arbiter. Several other trailers were released prior to launch, showcasing the updated cinematics and Terminals featured in Halo 2 Anniversary, and gameplay from all titles across the collection. On October 31, 2014, 343 Industries released a documentary, Remaking the Legend – Halo 2: Anniversary, chronicling the history of Halo 2 and the development of Halo 2: Anniversary; it also features interviews with developers at Bungie and 343 Industries. The documentary was initially broadcast on Twitch.tv, and was later available on the Halo Channel, Xbox Video, and YouTube. In August 2014, UK retailer Game revealed two special editions of The Master Chief Collection. The "Limited" edition includes a steel book case, a map book, and an in-game modifier, while the "Mjolnir" edition includes all the content from the Limited edition, along with a 1-foot (0.30 m) statue of the Master Chief. In October 2014, Microsoft announced a white Master Chief Collection Xbox One bundle for Brazil and other "select markets". A second Xbox One bundle containing the collection was announced for release in the United States during March 2015. The collection was released worldwide in November 2014. 343 Industries confirmed that the collection would be available to download from the Xbox Games Store on the day of release. A 15-gigabyte patch went live to those who had digitally preordered it through the Xbox Games Store on November 6, 2014. Players who preordered through the Xbox Games Store also received early access to the "Boom" Skull, which provides double the explosion physics in the Halo: Combat Evolved and Halo 2 campaign mode; it became available to all other users on December 12, 2014. At launch, many players experienced problems with online matchmaking modes. 343 Industries released numerous updates to address these issues. On November 24, 2014, Bonnie Ross, head of 343 Industries, issued a public apology noting issues "that have resulted in a frustrating experience, including long matchmaking times and low session success rates". On December 19, 2014, Microsoft announced that as an apology for the issues, it would give a free month of Xbox Live Gold, a special avatar and nameplate, and a free downloadable copy of the Halo 3: ODST campaign to those who played the game between its launch and December 19, 2014. The campaign mode of ODST was released to the public on May 30, 2015, and with it, 100 additional Achievements. It is available to purchase separately to those who are not eligible for a free code for the add-on. Spartan Ops, the episodic content originating in Halo 4, was released as free downloadable content for The Master Chief Collection on December 22, 2014. Additional Achievements for Spartan Ops and the multiplayer mode were released on January 8, 2015. Halo: Nightfall—a series of weekly, episodic digital videos directed by Sergio Mimica-Gezzan and produced by Ridley Scott—launched soon after the collection was released. The series was designed to connect the stories of previous Halo games to the upcoming Halo 5. The Halo 5 beta launched on December 29, 2014, and ran until January 18, 2015. With the release of The Master Chief Collection, Microsoft and 343 Industries announced an official competitive gaming league, the Halo Championship Series (HCS). 343 Industries partnered with the Electronic Sports League, live-streaming platform Twitch.tv, and other tournament organisers to foster the competitive multiplayer community in Halo. The first season of HCS, featuring Halo 2: Anniversary's multiplayer, launched in November 2014 and ran until March 2015. It served as a test bed for ideas and future plans that 343 Industries has for esports in Halo 5. In April 2018, the MCC Insider Program was launched to playtest upcoming changes to The Master Chief Collection, notably the various improvements to its interface and to its multiplayer modes. As a part of the various changes, 343 Industries introduced patches to re-add well-known Halo 2 glitches such as sword flying into its campaign, which led to increased interest in speedrunning the game. On August 27, 2018, the changes were published for all players. On March 12, 2019, following a series of teases, Xbox Game Studios announced on the Inside Xbox live stream that The Master Chief Collection would be coming to Microsoft Windows via the Steam digital distribution platform in addition to the Microsoft Store. Splash Damage and Ruffian Games aided 343 Industries in the development of the port. Xbox Game Studios plans to roll out the individual games in the collection separately, starting with Halo: Reach and then proceeding chronologically from Combat Evolved. Upon this announcement, 343 Industries' offices in Redmond, Washington were overwhelmed by pizza delivery orders from anonymous users, particularly from Reddit. Halo: The Master Chief Collection received generally positive reviews. Aggregating review website Metacritic gave it a score 85 out of 100 based on reviews from 69 critics. Reviews praised the graphics, frame rate, and content included in the bundle, but criticized the prominent matchmaking issues that prevented players from playing online multiplayer modes on release day. The technical issues deeply affected the game's online experience. Forbes' Paul Tassi wrote the game on release "was just flat out broken", and though improvements have been made, it "may very well be the worst major game release in a decade." Stuart Andrews of Trusted Reviews commented that "Halo 3 looks and feels surprisingly dated" when compared to the rest of the collection, particularly Halo 2 and Halo 4. Following the announcement of Halo: Reach being added to Halo: The Master Chief Collection and the announcement of the game coming to Microsoft Windows, 343 Industries was sent pizzas from fans. Brian Jarrard, community director at 343 Industries, eventually pleaded fans to stop sending pizzas, as the number of pizzas being delivered was getting overwhelming..
^ Additional work was done by Saber Interactive, Certain Affinity, Ruffian Games, Blur Studio, and United Front Games. The original trilogy (Halo: Combat Evolved, Halo 2, and Halo 3), Halo 3: ODST and Halo: Reach were developed by Bungie, while the original Halo 4 was developed by 343 Industries. Splash Damage and Ruffian Games assisted with the development of the Windows release. ^ a b c Makuch, Eddie (March 12, 2019). "Bringing Halo: MCC To PC Is A "Monumental Undertaking," So Microsoft Is Getting Help". GameSpot. Retrieved March 12, 2019. ^ a b c 343 Industries (May 30, 2015). "5.30.15 Halo: The Master Chief Collection Update Notes". Halo Waypoint. Retrieved May 30, 2015. ^ a b c d e f McWhertor, Michael (June 9, 2014). "Halo: The Master Chief Collection brings four Halo games to Xbox One Nov. 11". Polygon. Vox Media. Archived from the original on June 9, 2014. Retrieved June 9, 2014. ^ a b c d e f g Hsu, Dan (June 10, 2014). "Understanding Halo: The Master Chief Collection (FAQ) — playlists, Forge, control schemes, and more". VentureBeat. Archived from the original on June 14, 2014. Retrieved June 14, 2014. ^ a b c McCaffrey, Ryan (June 9, 2014). "E3 2014: Halo: The Master Chief Collection, Halo 5 Beta Announced for Xbox One". IGN. Ziff Davis. Archived from the original on June 9, 2014. Retrieved June 9, 2014. ^ B is for bravo (October 31, 2014). "THE NEXT 50 ACHIEVEMENTS". Halo Waypoint. Microsoft. Retrieved November 1, 2014. ^ Bravo (January 8, 2015). "ACHIEVEMENTS UPDATE". Halo Waypoint. Retrieved October 26, 2015. ^ Eldiablomechanico (June 9, 2014). "UFG/Microsoft: Halo: The Master Chief Collection". United Front Games. Retrieved November 7, 2014. ^ McCaffrey, Ryan (June 10, 2014). "E3 2014: Halo: The Master Chief Collection's Origin Revealed". IGN. Ziff Davis. Retrieved April 13, 2015. ^ a b c d e f Albert, Brian (October 7, 2014). "The Horse You Rode In On (A Halo: The Master Chief Collection Story)". IGN. Ziff Davis. Retrieved April 13, 2015. ^ Sheridan, Connor (October 18, 2014). "Halo: The Master Chief Collection UK release moved up". Computer and Video Games. Future plc. Retrieved October 18, 2014. ^ "What works - and what doesn't - in Halo: The Master Chief Collection". Eurogamer. Retrieved December 7, 2017. ^ "Halo: The Master Chief Collection". Ruffian Games. Retrieved October 26, 2014. ^ McCaffrey, Ryan (October 8, 2014). "Halo Channel Developer Walkthrough". IGN. Ziff Davis. Retrieved April 13, 2015. ^ a b c d e f g h i j k l m n "Remaking the Legend - Halo 2: Anniversary". YouTube. November 3, 2014. Retrieved April 13, 2015. ^ "Halo: Anniversary". The Sequence Group. Archived from the original on February 25, 2015. Retrieved April 13, 2015. ^ "Mo-cap on a budget: Halo 4 'Terminals'". Fxguide. February 21, 2013. Archived from the original on October 29, 2013. Retrieved April 13, 2015. ^ a b "The Halo 2: Anniversary Original Soundtrack Launches Day-and-Date with Halo: The Master Chief Collection on Nov. 11". Xbox Wire. Microsoft. November 7, 2014. Retrieved April 13, 2015. ^ a b "Halo: The Master Chief Collection "Hunter and the Hunted"". Digital Domain. Retrieved April 12, 2015. ^ a b "Halo The Master Chief Collection". YouTube. June 9, 2014. Retrieved April 12, 2015. ^ "Halo 3 "Starry Night"". Digital Domain. Archived from the original on February 25, 2015. Retrieved April 12, 2015. ^ "HALO 4 "Awakening"". Digital Domain. Archived from the original on February 25, 2015. Retrieved April 12, 2015. ^ "Halo: The Master Chief Collection Terminal Trailer". YouTube. July 5, 2014. Retrieved April 13, 2015. ^ "Halo 2 Anniversary Cinematic Launch Trailer [Official]". YouTube. October 29, 2014. Retrieved April 13, 2015. ^ "Halo: The Master Chief Collection Launch Launch Trailer". YouTube. November 5, 2014. Retrieved April 13, 2015. ^ Macy, Seth (October 24, 2014). "Halo 2 Documentary Gets Release Date". IGN. Ziff Davis. Retrieved April 13, 2015. ^ Yin-Poole, Wesley (August 6, 2015). "£170 Halo: The Master Chief Collection Mjolnir Edition has 12" Master Chief statue". Eurogamer. Gamer Network. Retrieved April 13, 2015. ^ Sirani, Jordan (October 8, 2014). "Halo: The Master Chief Collection White Xbox One Bundle Revealed". IGN. Ziff Davis. Retrieved April 13, 2015. ^ Sheridan, Connor (March 9, 2015). "New Xbox One bundle includes Halo: Master Chief Collection". GamesRadar. Future plc. Retrieved April 13, 2015. ^ a b c Sarkar, Samit (October 17, 2014). "Halo: The Master Chief Collection up for digital preload, Spartan Ops delayed to December". Polygon. Vox Media. Archived from the original on October 17, 2014. Retrieved October 19, 2014. ^ Seppala, Timothy J. (November 6, 2014). "'Halo: The Master Chief Collection' has a smaller day-one patch than expected". Engadget. AOL. Archived from the original on November 6, 2014. Retrieved November 6, 2014. ^ Haywald, Justin (November 14, 2014). "Halo Master Chief Collection Developer Says Matchmaking Solution Coming Soon". GameSpot. CBS Interactive. Retrieved November 13, 2014. ^ Ross, Bonnie (November 24, 2014). "A Status Update From Bonnie Ross on Halo: The Master Chief Collection". Xbox Wire. Microsoft. Retrieved November 25, 2014. ^ McWhertor, Michael (December 19, 2014). "Halo 3: ODST remaster coming to The Master Chief Collection for free as apology to players". Polygon. Vox Media. Retrieved December 20, 2014. ^ Hussain, Tamoor (May 30, 2015). "Halo 3: ODST Remastered Out Now on Xbox One". GameSpot. CBS Interactive. Retrieved July 2, 2015. ^ Sarkar, Samit (December 22, 2014). "Halo: The Master Chief Collection gets Halo 4's Spartan Ops and more fixes today". Polygon. Vox Media. Retrieved April 22, 2015. ^ "'Halo: The Master Chief Collection' Getting New Achievements, Fixes Over Next Two Weeks". Inquisitr. January 6, 2015. ^ "Halo 5: Guardians Xbox One Multiplayer Beta to launch next week". Punch Jump. December 27, 2014. Retrieved December 27, 2014. ^ Gies, Arthur (November 5, 2014). "Halo gets serious about eSports with the Halo Championship Series". Polygon. Vox Media. Retrieved April 22, 2015. ^ "MCC Insider Program". Halo Waypoint. November 2018. Retrieved December 23, 2018. ^ "MCC Update". Halo Waypoint. August 27, 2018. Retrieved December 23, 2018. ^ Vincent, Brittany. "'Halo: The Master Chief Collection' Coming To Steam, Adding 'Halo: Reach'". Variety. Retrieved March 12, 2019. ^ Avard, Alex (March 13, 2019). "343 Industries flooded with pizza deliveries as fans react to Halo: The Master Chief Collection on PC". GamesRadar+. ^ a b "Halo: The Master Chief Collection for Xbox One Reviews". Metacritic. CBS Interactive. Retrieved February 13, 2015. ^ Ditum, Nathan (October 11, 2014). "Halo: The Master Chief Collection review". Eurogamer. Gamer Network. Retrieved December 10, 2014. ^ Hilliard, Kyle (November 9, 2014). "Halo: Master Chief Collection". Game Informer. GameStop. Retrieved December 10, 2014. ^ Watters, Chris (November 15, 2014). "Halo: The Master Chief Collection Review". GameSpot. CBS Interactive. Retrieved November 29, 2014. ^ Maccaffrey, Ryan (November 6, 2014). "HALO: THE MASTER CHIEF COLLECTION REVIEW". IGN. Ziff Davis. Retrieved November 15, 2014. ^ a b Gies, Arthur (November 7, 2014). "Halo: The Master Chief Collection review: the library". Polygon. Vox Media. Archived from the original on November 19, 2014. Retrieved April 12, 2015. ^ a b "Halo: The Master Chief Collection review". trustedreviews.com. November 7, 2014. Retrieved May 25, 2015. ^ "Halo: The Master Chief Collection". GameRankings. CBS Interactive. Retrieved February 4, 2015. ^ Tassi, Paul (February 20, 2015). "100 Days After Release, Continued Mourning For 'Halo: The Master Chief Collection'". Forbes. Retrieved February 20, 2015.